From Bentley's very earliest days, open-top cars have been an intrinsic part of the company's heritage. Over the decades that followed many revered convertible or 'drophead' models were created, both by notable Bentley coachbuilders such as Mulliner, Park Ward, and later 'in-house' at the company's Crewe headquarters. From the 1955 Park Ward S1 Drophead Coupe, through the later Corniche and Continental eras, up to the magnificent Azure of 1995, an entire portfolio of unashamedly glamorous and wonderfully desirable cars meant that Bentley retained its reputation as the creator of the world's most elegant convertibles. 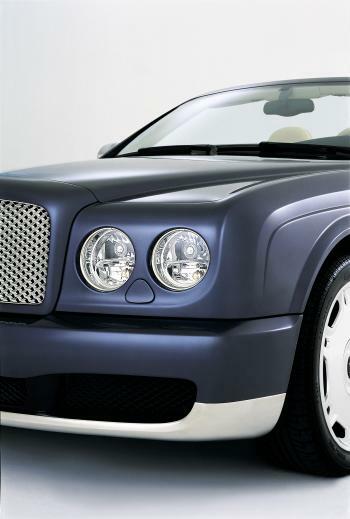 Now that reputation has grown once more with the unveiling of the new Bentley Arnage Drophead Coupe show car at the 2005 Los Angeles Auto Show. 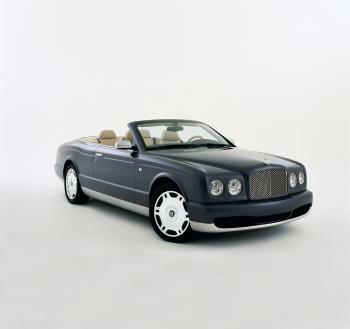 It is a true four-seater convertible for the 21st century: a unique blend of classic Bentley design and craftsmanship married to a high-technology platform sourced from the 2005 Model Year Arnage. As such, it is the perfect natural successor to the Bentley Azure, whose eight-year lifespan cemented the marque's status as the prime provider of four-seater convertibles to this sector of the market. First and foremost, the design is unmistakeably Bentley - it shares the same front end as the current Arnage range and its platform ensures it seats four adults in complete comfort. But it is also unmistakeably unique. The entire cabin and rear section of the car are newly designed, with a stunning new interior that has been influenced by contemporary furniture design; the objective being to create an opulent and inviting seating area that reflects its status as a car that is at home in Palm Springs or on the Riviera. "We had such amazing success with the Bentley Azure, which has developed a cult following although production stopped in 2003. There's no reason why this new Arnage derivative couldn't fill the gap left by the Azure. If customer demand is there, it could go into production within a very short space of time - as early as Spring 2006." - The world's most elegant four-seater convertible that provides a powerful and refined open-top driving experience. - Accommodation for four adults in complete comfort. 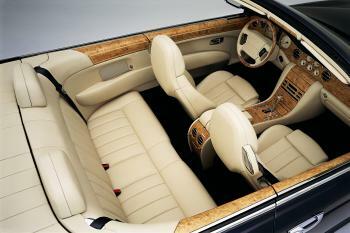 The interior cabin is wider in the front and rear than the previous Bentley Azure convertible - the rear by 20%. - New streamlined convertible body style with raked windscreen and fully automated canvas roof that stows perfectly flush in 25 seconds. - Shares the Bentley Arnage's state-of-the-art platform, wheelbase and powertrain with 6.75-litre twin-turbocharged V8 engine producing 450bhp (336Kw) and 875Nm (645lb ft) torque. - Benefits from the comfort suspension recently introduced on the Bentley Arnage R.
- Pop-up rollover protection system for occupant safety in the event of over-turning. - Unique interior styling with new seats, 'floating' armrests and mood lighting. Show car trimmed in Cotswold and Nautic Blue leather and Burr Oak veneer with a Boxwood inlay. - Full production capability by Spring 2006 depending on market reaction. 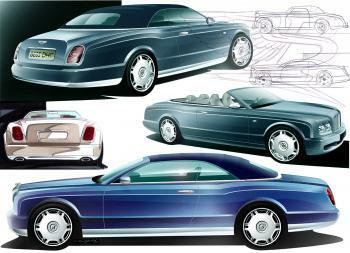 Bentley's design team cites the 1955 Park Ward S1 Drophead Coupe and 1995 Azure as its main influences for the Arnage Drophead Coupe show car. Like the '50s convertible, the car has a deep body with a single feature line that runs along both flanks and rises at the powerful rear haunches before spearing off at the rear of the car. Similarly, the Azure's fast and flowing roofline is echoed in the show car's stunning seven-bow canvas roof that gives the car such a visible sporting profile when raised. "The Arnage Drophead Coupe is the latest in a long line of much-admired Bentley convertibles and we wanted to reflect that heritage as directly as possible," says Dirk van Braeckel, director of design, Bentley Motors. "The key to a four-seater convertible is that its grace and elegance is on display when the roof is down but it shouldn't lose any of that beauty when it is raised. We think we have struck that balance with the beautiful lines of the roof." That objective was achieved, explains Bentley's head of exterior design Raul Pires by inclining the windscreen as far back as possible - the car is 35mm lower than an Arnage. "We have tried to make the roof look as 'fast' as we can," he says. "The result is a design that combines fluidity, sportiness and elegance." A new rear boot section also helps to accentuate the contemporary feel of the new convertible. Prominent wheel arches grace a slender, narrowing boot that results in a 'horse shoe' trailing edge. This graceful shape is reminiscent of the first Crewe-built Bentley, the 1946 MK6, and the overall effect is a subtle nod to the power and performance that lies beneath the stunning Meteor Blue bodywork. Of course, the nature of a convertible means that its interior is often on display as much as its exterior and the design team knew that the car's spacious cabin would need to make as big a statement as its stunning body. The decision was taken early on in the programme to design a rear-seat compartment that captures some of the exquisite feel and look of earlier Bentley convertibles. "The S1 Drophead Coupe from 1955 had a wonderfully understated but luxurious interior," says Robin Page, head of interior design, Bentley Motors. "For example, the doors had simple armrests with a leather pad on them and we have reflected that in this car's hide-trimmed armrests that run the length of the cabin sides and appear to be suspended away from the door's actual surface. It's not only heritage that influenced the Arnage Drophead Coupe's look and feel. The interior design team appreciated the simplicity of the contemporary Peel chair created by Norwegian Olav Eldoy, who recognised that the swirling curve of a slice of orange peel could be the concept for a body-hugging seat. Those same principles are reflected in the curving rear seat and arm rest. For added atmosphere, indirect lighting casts a warm glow of light behind the door arm rests. "The real challenge of this programme was to develop a car that had such stylish lines in the timescale we had available. With good planning and close teamwork we were able to combine simultaneous engineering and design with the latest 'fast-track' technologies - it was a great mix of conventional and new thinking. "For example, right up to the point of engineering, digital data was taken from the clay model's surfaces on a day-by-day basis, even while some parts of the clay were still evolving. This ensured we could transfer the right design feeling directly to the CAD surfaces which are used to make the tooling. And to ensure that the designers could continue to make quick revisions to the car, new technologies were adopted as the programme progressed. The body panels, for example, were actually pressed from special resin-based tools which could be machined in a matter of days." The twin-turbocharged V8 engine, double-wishbone suspension and extremely rigid body structure of the 2005 Model Year Arnage R provide a state-of-the-art basis for the Drophead Coupe. The show car is powered by a 450bhp (336Kw) version of the Arnage R's 6.75-litre twin-turbocharged intercooled V8 engine and produces 875Nm (645lb ft) of torque. The Arnage's impressive ventilated brakes with Electronic Stability Programme, Antilock Braking System and Electronic Brake pressure Distribution work in conjunction with the independent double wishbone suspension and a computer-controlled adaptive electro-hydraulic damping system to ensure optimum stability and handling at all times. The Arnage Drophead Coupe also benefits from the introduction of the new comfort suspension system used on the Arnage R.
"There is clearly nothing quite like this car in the world - it is in a niche of its own. By the spring of 2006 we expect to be able to start production if there is sufficient interest from potential customers. It truly is the world's most elegant convertible." The Arnage Drophead Coupe is that most admired of motor cars - a classic Bentley convertible based upon a tried and tested engineering platform that can fulfil the dreams of customers looking for exclusivity and indulgence in a car that evokes the Riviera lifestyle like no other. "The launch of this car highlights the amazing flexibility of Bentley's engineering processes, demonstrating yet again that Bentley is the leader when it comes to bespoke cars," says Dr Ulrich Eichhorn, member of the board, engineering. "Some of the skills we have at Bentley don't exist anywhere else in the world and it shows in this car."